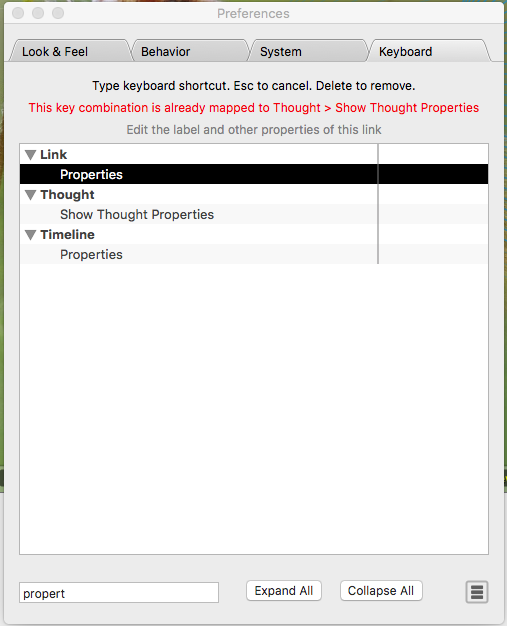 The thought details dialog can be opened with alt-return, whereas there is currently by default no shortcut for "Link > Properties". Of course, I could define one by myself via "TheBrain > Preferences... > Keyboard". I do not know a state, where there's in TB a choice (...without moving the cursor/changing the selection...) between show-thought-details and show-link-details. In plain words: those two functions exclude each other. Just a small hint: there's either the "Thought" menu item, or the "Link" menu item, and never both at the same time. By this, is logical and should be possible to assign the very same shortcut (alt-return) to both functions. Another small detail: if I select a link, the menu changes. If the mouse cursor just hovers above a link, it does not. To avoid a "menu flicker" it would be imho sufficient, to wait for e.g. a second before changing the menu. Thank you for posting. I'll document these issues for further review by the engineering team. You are correct that the Alt+Return is the default setting for your Show Thought Properties and interesting that the symbols do not appear in your screenshot. I've tested locally and I do see ⌥ ⏎ for this setting.